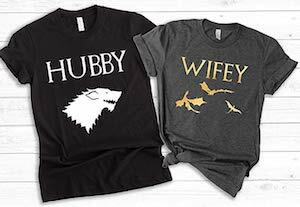 Now you and your partner can watch Game of Thrones in style all thanks to this Game of Thrones Couples T-Shirts. The shirts are sold separately and have lots of options like the type of shirt, print color, sizes and more but all are about Game of Thrones. The men’s shirt shows the logo of house Stark and above it, you find the text “Hubby” and the women’s shirt shows flying dragons and above the dragons, it says “Wifey”. So now you can dress up together to watch and re-watch your favorite episodes of Game of Thrones. And if you wear these shirts out and about then people will know that you guys love Game of Thrones.